Right now, a virtual reality battle is being waged between high-end VR companies, HTC VIVE and the Oculus Rift. Both platforms came out at the same time, but only the HTC VIVE had dedicated tracking controllers while the Oculus Rift only had a traditional XBOX controller for users to play around with. As a result, HTC VIVE had a head start of about a year as Oculus Rift kept busy designing their own dynamic virtual reality controllers. Well, the wait is now over. Oculus Rift has finally released their “Touch” controllers and I’ll be reviewing the pros and cons of each platform’s offerings. Before you’re able to use the Oculus Touch, you have to first set up your room-scale for proper tracking. 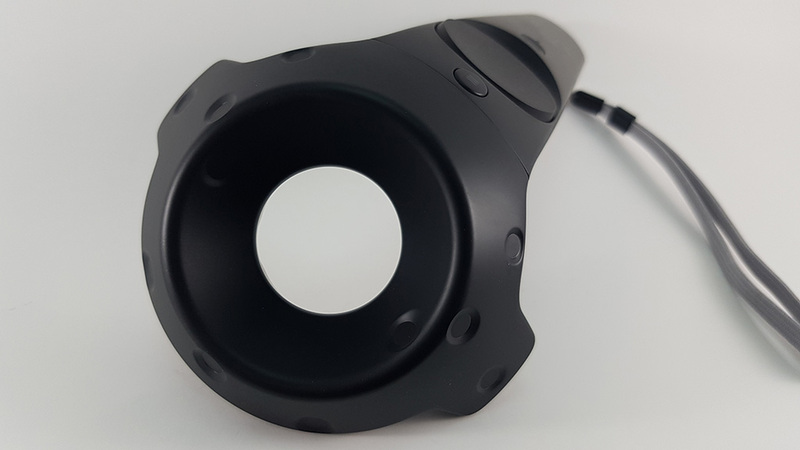 Both the VIVE and the Oculus use infrared sensors to communicate with your PC to measure exactly where you are moving your headset and hands in virtual space. If you bought an Oculus Rift back when it was first released, and now purchased the Oculus Touch, you will receive an additional Oculus sensor. Setting up your Oculus sensors is quite easy. Just follow the tutorial and start “painting” your play area and you’re done. However, it should be noted that the HTC VIVE’s lighthouses are much more suited at capturing room scale than the Oculus. Traditionally, the Vive is meant for room scale VR experiences whereas the Oculus is more suited for front facing gameplay. But as VR users soon discovered that room scale VR experiences were much more immersive and Oculus has tried to replicate this by suggesting the purchase of a third Oculus sensor. It should also be noted that the Oculus’ room scale is still experimental. With that out of the way, let’s begin discussion on the Oculus Touch itself. At first glance, the Oculus Touch controllers are very lightweight and feel extremely ergonomic when you first grip them. Each touch controller comes with a fastening string that you fit around your wrist to prevent the Touch from accidentally slipping off your hands. As I stated earlier, the Touch is extremely lightweight and is well contoured to fit the average hand. 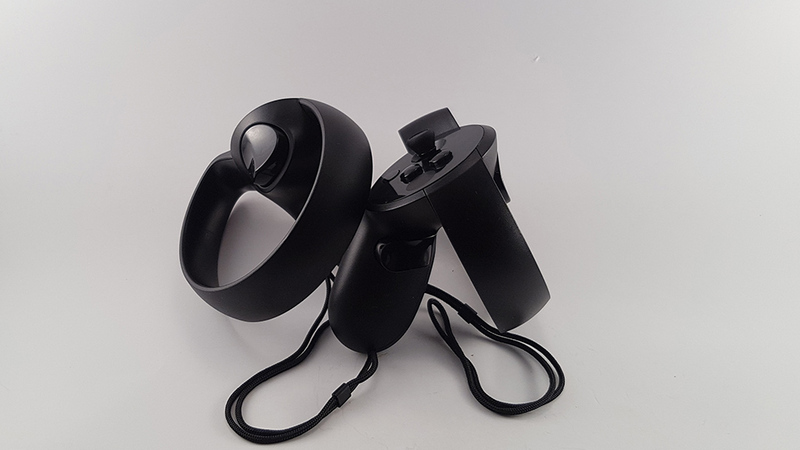 The buttons and triggers are all designed with capacitive feedback in mind, meaning that you will see more of a variety with hand motions when viewing through your VR headset. Your hand can now be made to look like you’re actually manipulating objects. There’s definitely a newfound sense of increased immersion when you’re able to point and see your forefinger flick out in VR space. The feeling is pretty breathtaking when the psychic dissonance of what your hand is doing in real life versus what it is doing in virtual space that is just incredibly cool. I can see the Touch’s hand movement versatility being very useful and applicable in social VR games. All of the buttons are positioned in natural places and crevices around the Touch in a way that feels incredibly intuitive as well. I showed one of my friends quick demo shooter, “Bullet Train” and he was able to pick up the button mapping within seconds of playing. Let me just say that the HTC VIVE controllers or wands are still very competent devices. Each HTC VIVE controller is identical, meaning either hand can use them whereas the Oculus Touch controllers are outfitted to fit each your left and right hand. Again, the biggest advantage that the Oculus Touch controllers have is more variety with finger movements which will be useful in games heavy on finger directional pointing like “The Unspoken” where different finger configurations are used to cast a myriad of different spells. The Oculus Touch uses batteries as a power supply and are kept in place with a nifty magnetic encasement. Power usage typically lasts around 30 hours of gameplay, but even then, I would still recommend buy some rechargeable batteries. Owners of big hands, beware. Some friends here with bigger than normal-sized hands have reported massive discomfort and hand seizing when trying to play with the Oculus Touch. Unlike the HTC VIVE that fits all hands since you can hold it any way you want to, the Oculus Touch forces you to hold it a certain way and that can spell disaster for big hand users. HTC VIVE’s capacity for room-scale VR gaming is unquestionably better. Oculus sensors require a USB connection, so prepared to have long wires running around if you plan to have a third sensor to track what’s happening behind you. If you are the owner of big hands, the Oculus Touch will not be comfortable. Even though the HTC VIVE and the Oculus both use basically the same hardware in terms of their headset, the Oculus Rift is noticeably better in terms of visual quality. HTC VIVE is already secretly working on the next generation of controller, which will do away with their current “wand” design and adopt something more similar to what Oculus Touch already has, so in the end, it may be better to just wait it out. I hope this review has been informative and I’ll keep updating as more VR news develops. Thank you for reading. Try the HTC VIVE for yourself.